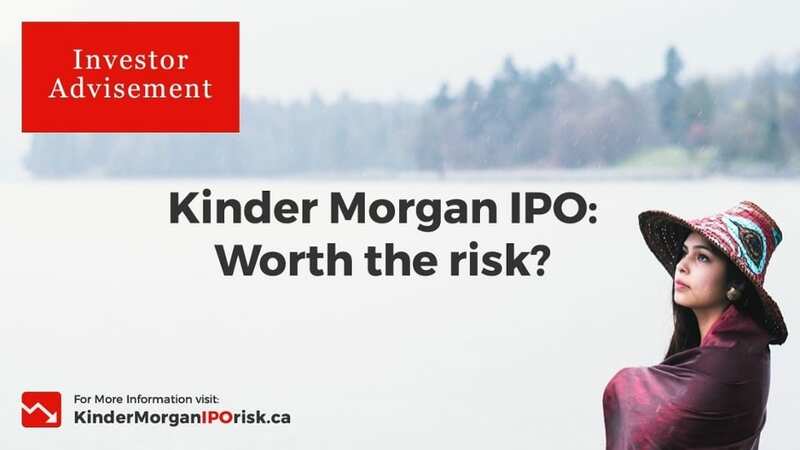 The Tsleil-Waututh Nation has launched a new campaign targeting potential investors in the Kinder Morgan pipeline highlighting the legal and political risks of the proposed Kinder Morgan pipeline ahead of the company’s IPO. “We want to make it clear to anyone considering investing in this controversial project just how risky of an investment that would be” said Charlene Aleck, elected Tsleil-Waututh Nation Councilor and a spokesperson for the Nation’s Sacred Trust Initiative. The Nation is circulating a new report with likely KML IPO investors which outlines these risks that were prepared in partnership with West Coast Environmental Law. Recipients include the five major banks, the eight major public pension funds, and funds investors that have signed ESG (environmental social and governance) commitments, as well as those involved in the CCGG (Center for Corporate Good Governance). The report is featured on a new campaign website KinderMorganIPOrisks.ca. “The legal brief we have prepared discusses the 19 current cases, and adds detail and context to the risks Kinder Morgan themselves disclose in their prospectus documents,” said Eugene Kung from West Coast Environmental Law. The campaign website and related advertisements released by the Tsleil-Waututh Nations Sacred Trust Initiative quotes Kinder Morgan directly saying “Major projects like the Trans Mountain Expansion Project may be inhibited, delayed or stopped…” and “the loss of revenue… is likely to exceed 88,000,000 per month of delay”. “Anyone doing their due diligence on this proposed project should know that this project may have some of the federal permits but it certainly does not have the consent of local First Nations or the permission of the people of BC who just voted overwhelmingly for parties who opposed the project” said Aleck. The campaign site also features a financial risk assessment document, links to related news stories and the Nations peer reviewed environmental assessment documents and supplements report. The Tsleil-Waututh Nation, has previously met with Kinder Morgan’s largest institutional shareholders representing over $15 billion in shares and including: Goldman Sachs, JP Morgan, Morgan Stanley, Citi Bank, TIAA-CREF, Miller Howard, Vanguard, State Street and Fidelity. “People on Bay Street may not really understand just how red hot opposition is in BC or how strong the legal rights of First Nations communities can be” said Kung. “The message to potential investors is to be careful, this is not a smart investment”.